Although glass is a manufactured material, there exist several forms of naturally formed glass. When lightning strikes a mass of sand containing the right combination of minerals, objects called fulgurites are formed. Brittle, glassy tubes, fulgurites preserve the shape of the lightning strike as it diffuses through the sand. Tektites, smooth, dumbbell-shaped glassy objects, are the result of molten blobs of rock thrown up into the air when a meterorite hits the earth. Volcanic glass, or obsidian, is formed when the intense heat of a volcano fuses sand. Hard, black, and shiny, obsidian forms sharp edges when broken and can be easily worked to make bowls, mirrors, jewellery, knives, arrows, and spearheads. 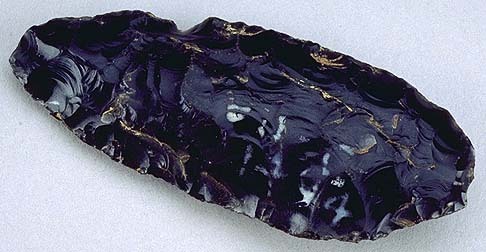 The Native peoples of western Canada traded obsidian from the Yukon and Alaska up and down the Pacific coast.